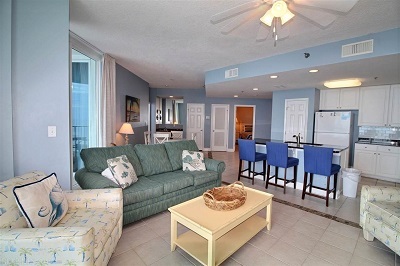 Gulf Shores condominium home for sale at Lighthouse. Perfect Gulf Shores location!! Walk to all the fun and restaurants!! Endless views from this large 3 bedroom, 3 bath condo. Floor to ceiling windows from the living area and master bedroom give you some spectacular views. Large deck spanning the length of the unit. This condo features tile throughout the unit, granite in kitchen, bathrooms and wet bar! Nicely decorated and has good rental income. The complex is highly sought after and boasts many amenities.